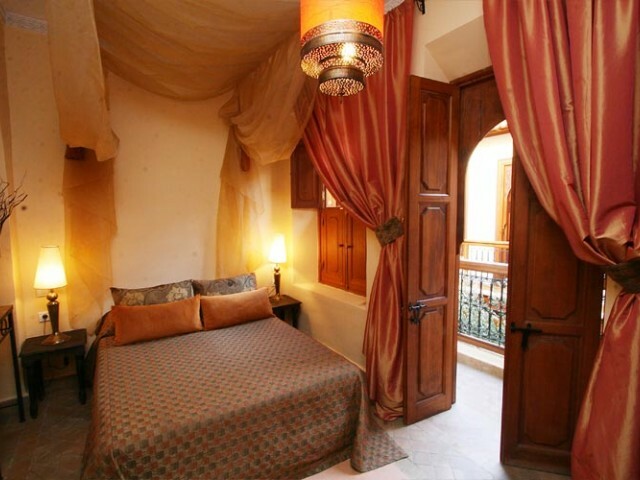 The guest house "DAR SAAD" classified in first category is located in the El Bacha district, the one of the three most beautiful parts of the Medina with Ksour and Mouassine. His access transport will allow you to join us most pleasantly possible. 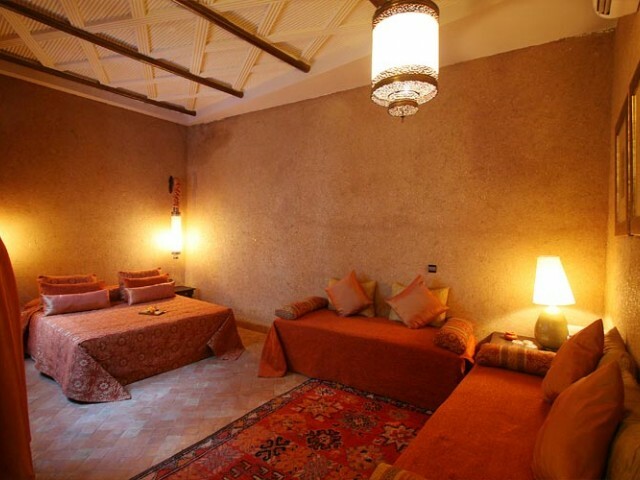 In a few minutes walk you will discover the Palace of Glaoui "Dar El Bacha" the historical and tourism place, the Arabic coffee, and as well as the most equally famous place Jemaa El Fna. 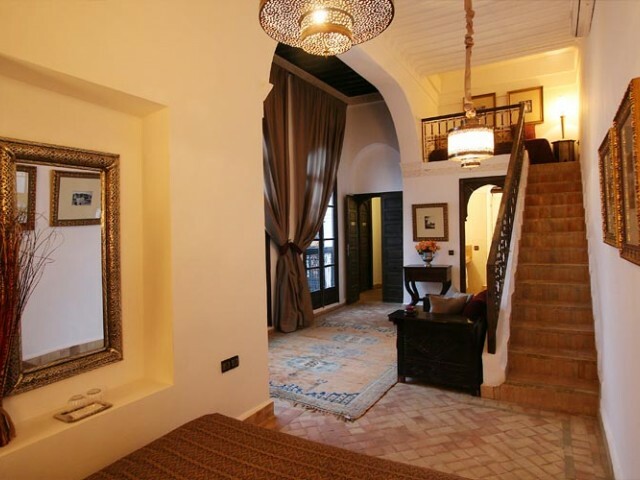 Our former home of the 18th century, was restored in the purest oriental tradition to offer you comfort and tradition. 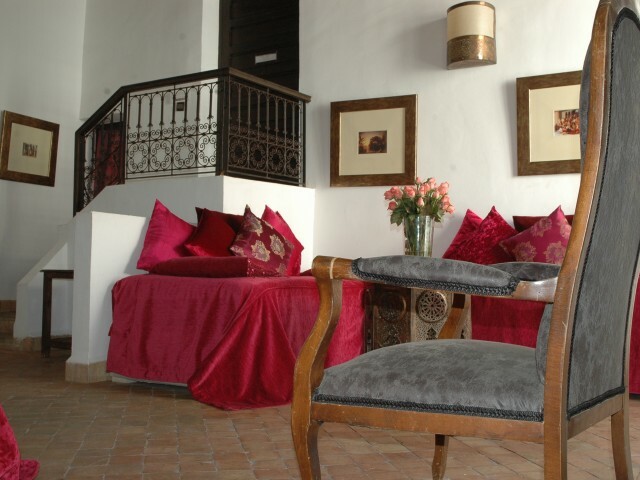 Our riad is consists of seven suites, four rooms and one of the patio is decorated with a swimming pool is Zellige. 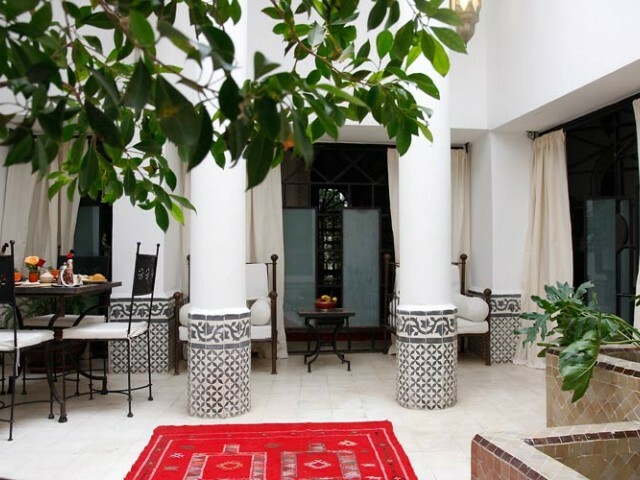 Our vegetated terrace is an invitation to enjoy of our riad completely relaxed. 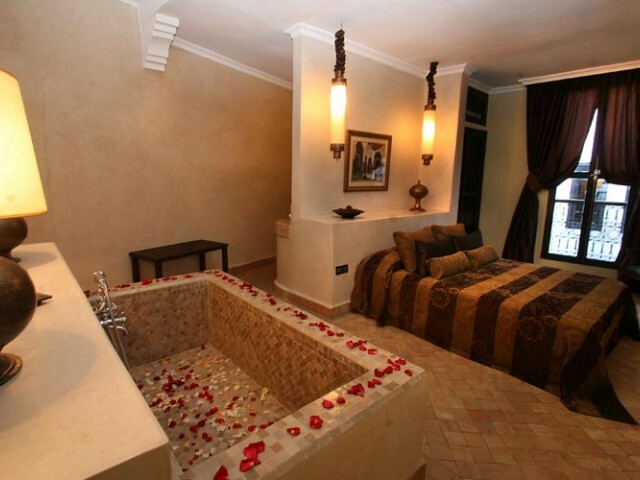 Want to celebrate birthdays, weddings, incentives ... the exclusive formula "Dar Saad" is made for you. 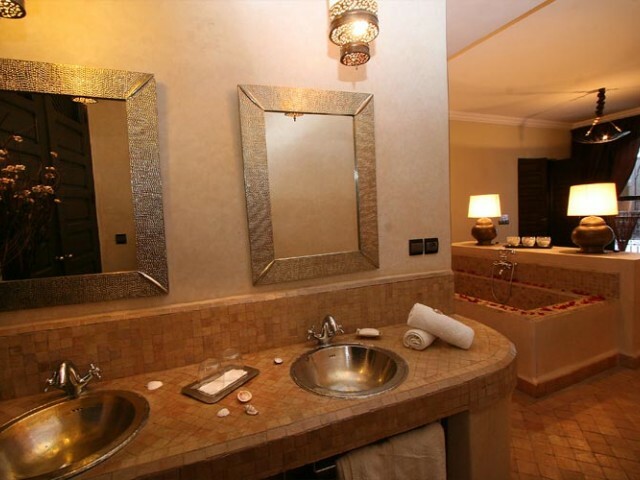 Want of care and welfare ... swimming pool, hammam and massages will be waiting for you. 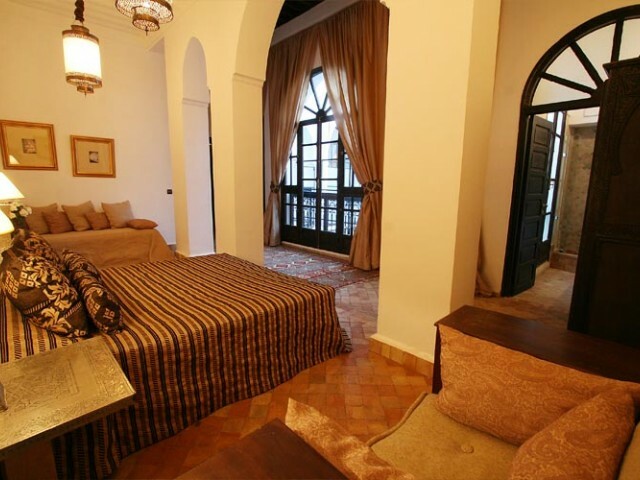 The Riad Dar Saad gives you the "keys" to a great stay, judge by yourself ... See you soon. 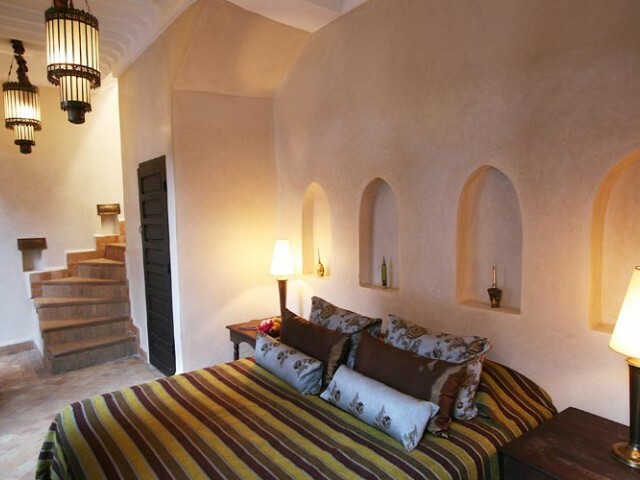 Situated in the 1st Floor, this room gives on a magnificent sculptured wooden area, it's wall ismade of beige tadelakt. 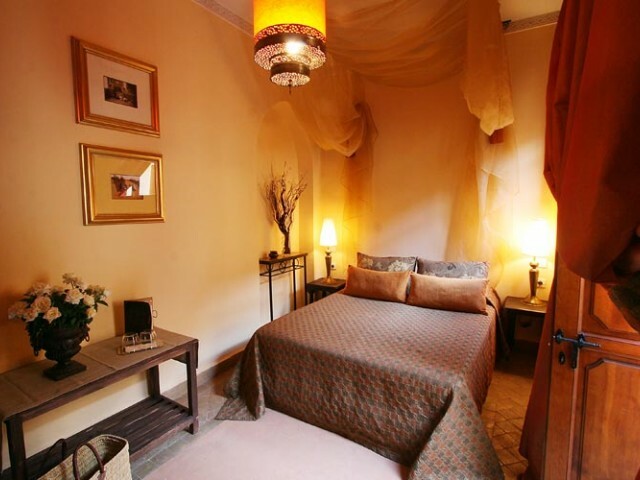 There is two beds with the possibility to be gathered in a big bed, for your comfort it is fitted out by a reversible air conditioning and by a safe.The bathroom is also made of tadelakt beige and blue zellige.it is equipped with a hairdryer and with shower products in the scents of east. Intimist and soft room which dominates a magnificent sculptured wooden area, this room has double bed overhung by a canopy in ecru lace curtain. 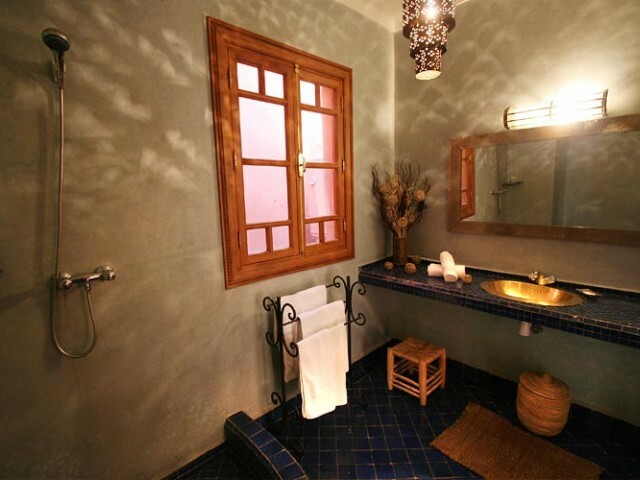 For your comfort,it is fitted out by a reversible air conditioning and by a safe.The bathroom is made of peach tadelakt and green zellige.it is equipped with a hairdryer and with shower products in the scents of east. Bright room with orange tadelaktwhich gives on a magnificent sculptured wooden area, it s composed of 3 beds of 1 person each and a wooden closet. 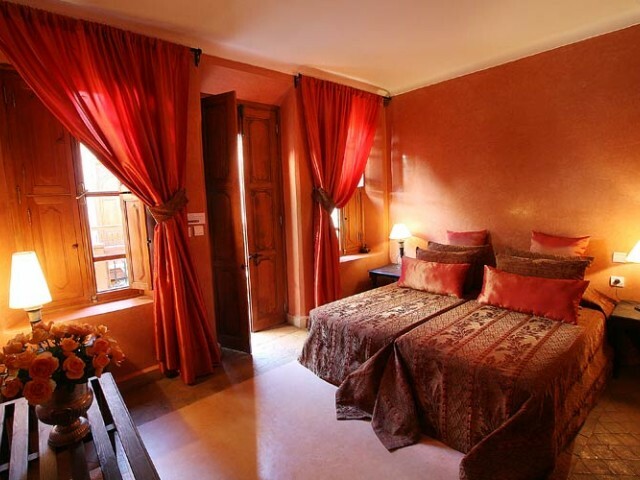 the cover of beds is damasked orangy color and the curtains in taffeta of the same tone and it makes of it a peacful room. 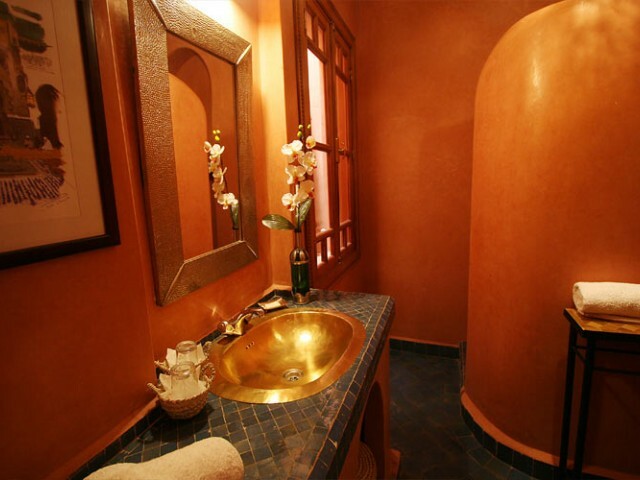 For your comfort, it is fitted out by a reversible air conditioning and by a safe.The bathroom is made of orange tadelaktand midnight blue zellige.it is equipped with a hairdryer and with shower products in the scents of east. 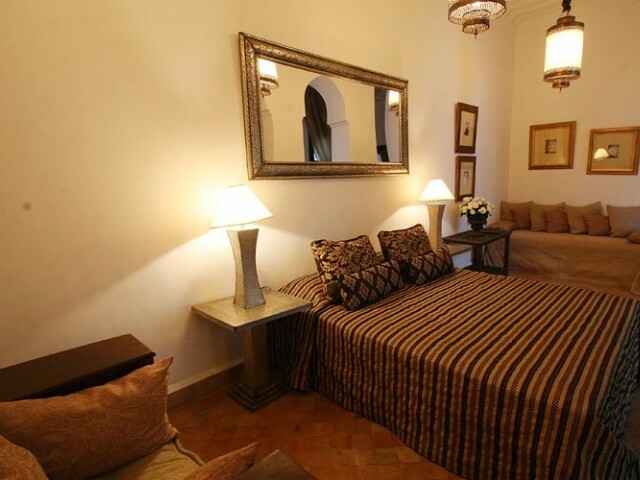 Spacious room which gives on a magnificent sculptured wooden area, it contains one double bed and a single bed. The wood in the room and the cover of the beds in the bronze and brown tones give to the room a warm atmosphere. For your comfort, it is fitted out by a reversible air conditioning and by a safe.The bathroom is made of green tadelakt and blue zellige. it is equipped with a hairdryer and with shower products in the scents of east. 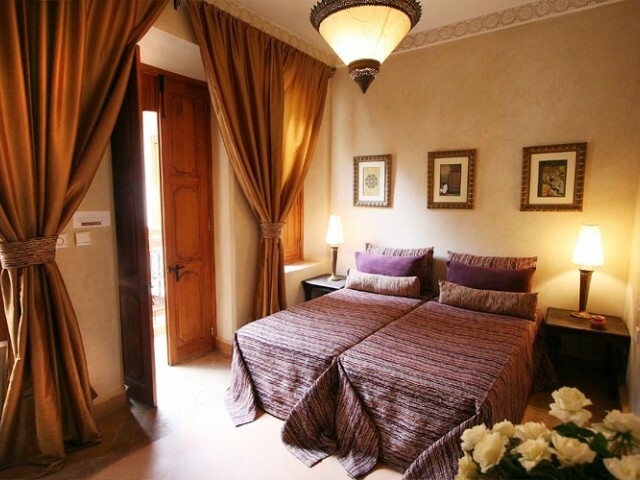 This very lightened suite equipped with a big bed, has bow windowsgiving onto the swimming pool, stairs in the room take you to a vegetated private terrace where you can have a rest. 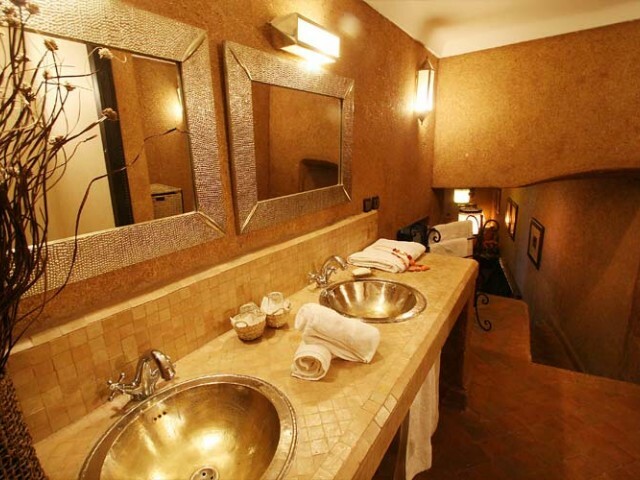 For your comfort, your suite is fitted out by a reversible air conditioning, by a safe and by a mini bar.The bathroom is made of beige tadelaktand zellige in the same tone, decorated with two copper bowls and with a shower. 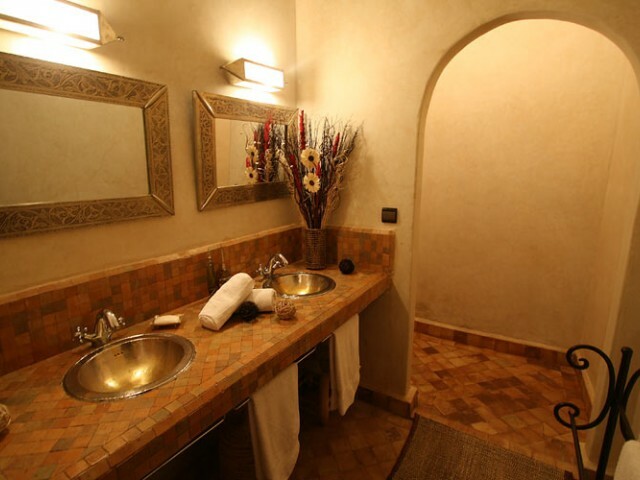 it is equipped with a hairdryer and with shower products in the scents of east .the toilets are separated. 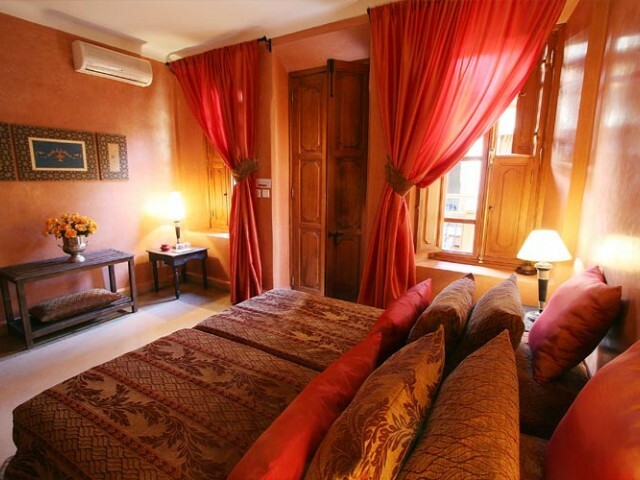 This elegant suite in bronze fabrics and in silky curtains, it is equipped with a big bed and with a single bed. 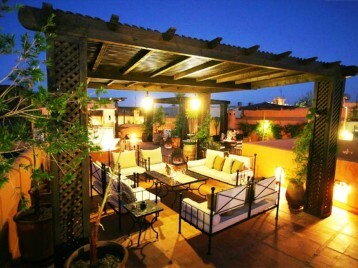 The night tables hammered and the Moroccan lamps combine the contemporary and the former decoration. For your comfort, this suite is fitted out by a reversible air conditioning, by a safe and by a mini bar.The very bright bathroom made of tadelaktand zellige in the same tone is decorated with a copper bowl and with a shower.it is equipped with a hairdryer and with shower products in the scents of east. The toilets are separated. This lightened suit with its two big wooden windows is equipped with a big bed with a bedhead of old wooden door paints. stairs lead you to the mezzanine which is an intimist placefor reading which can welcome if need the third person. 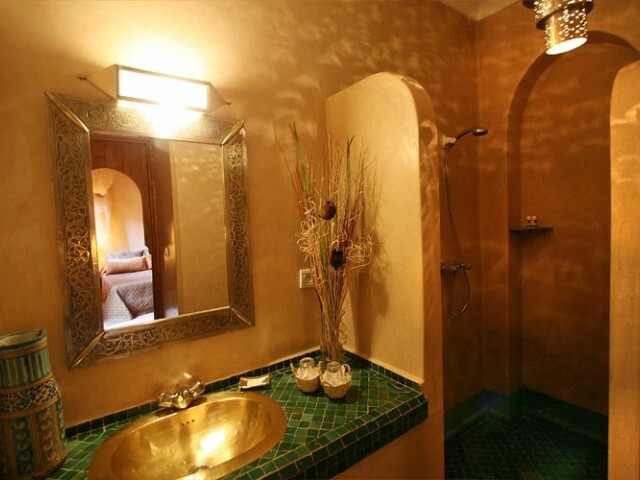 For your comfort, this suite is fitted out by a reversible air conditioning, by a safe and by a mini bar.The bathroom made of tadelakt and zellige in the same tone is decorated with a copper bowl and with a shower.it is equipped with a hairdryer and with shower products in the scents of east. 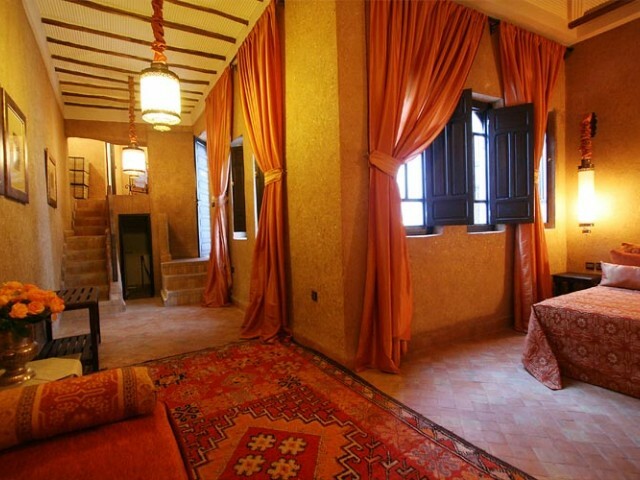 This beautiful suite is certainly the most original of the riad, its walls in pisé (mixture of earth and straw, very used in Morocco for the construction of kasbahs), gives to this suitea very particular atmosphere.its lights and its orange fabrics make it very warm.It is equipped with a big bed and with two single beds, so could welcome a family of 4 persons. 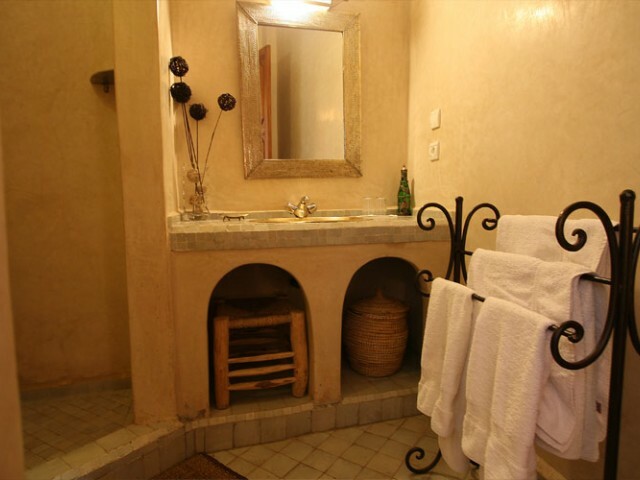 For your comfort, this suite is fitted out by a reversible air conditioning, by a safe.The bathroom in pisé and zellige in the same tone is decorated with two copper bowls and with a showermad of tadelakt (orange color).it is equipped with a hairdryer and with shower products in the scents of east.Toilets are separated. 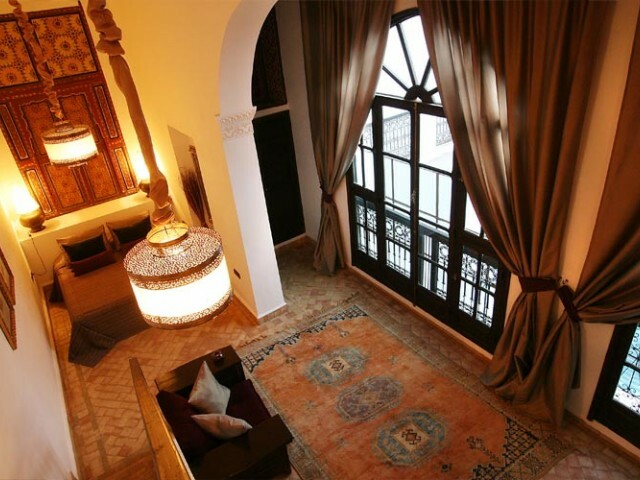 In Arabic " The house of guests ", you will enjoy this suite its big space and its exceptional surface (50M2). Its painted wooden ceilings, its old door and its heavy red curtains transport you to an another time. it has 1 big bed and two single beds. 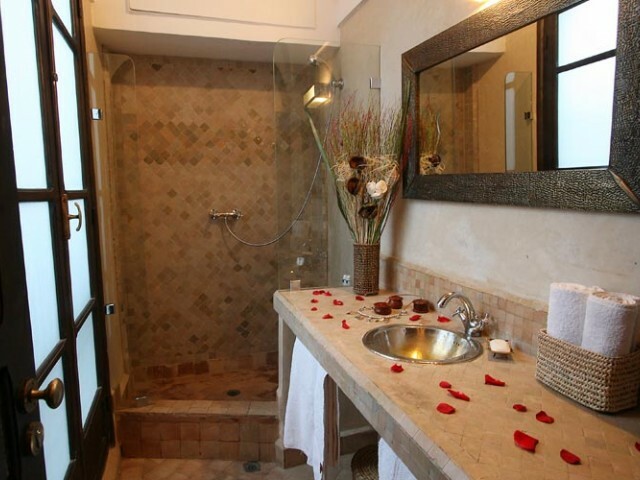 For your comfort, it is fitted out by a reversible air conditioning, by a safe and by a mini bar.The bathroom made oftadelaktand zellige in the same tone is decorated with two copper bowls and with a shower. it is equipped with a hairdryer and with shower products in the scents of east. The toilets are separated. 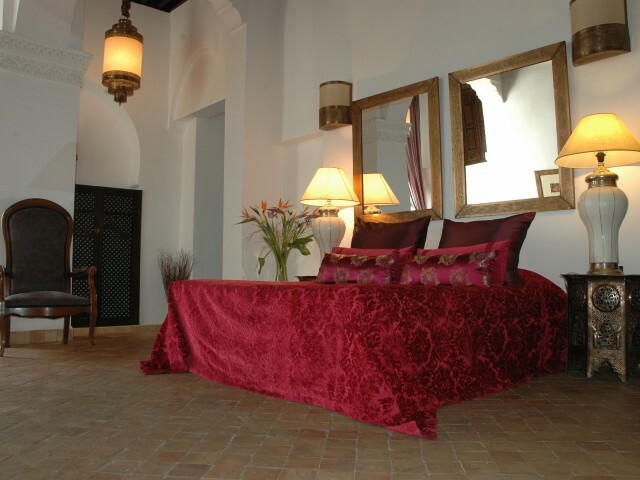 The most romantic suite of the riad is equipped with a big bed.its originality is due to the fact that a bathtub in zellige is in the middle of the room,this suite has wallsmade of tadelakt and Moroccan lamps that s what confer to it a sophisticated atmosphere. 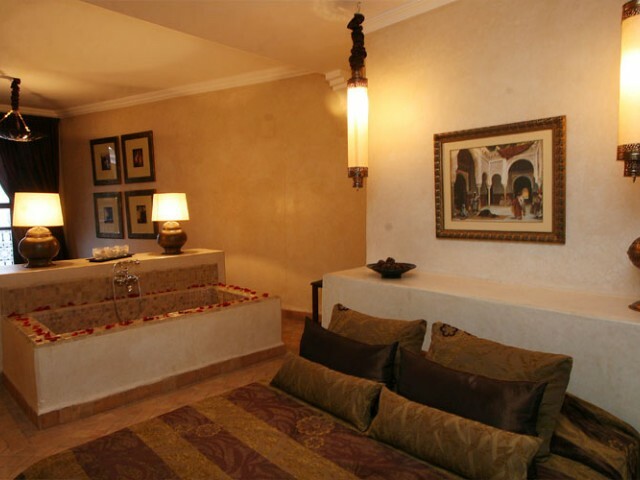 Its entrance decorated with pillows in soft colors allows you to relax comfortably and can welcome if neededthe third person. For your comfort, this suite is fitted out by a reversible air conditioning, by a safe and by a mini bar.The bathroom is made of tadelaktand zellige in the same tone is decorated with two copper bowls and with a shower.it is equipped with a hairdryer and with shower products in the scents of east. The toilet are separated. 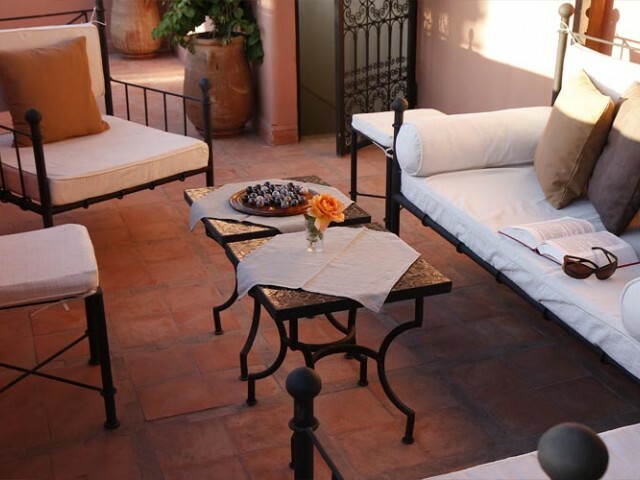 This big suite (65m2) elegant and decorated with antiques is ideal to welcome a family.it consists of a room with a big bed and the second room with two single beds, these rooms give onto a very bright private patio. 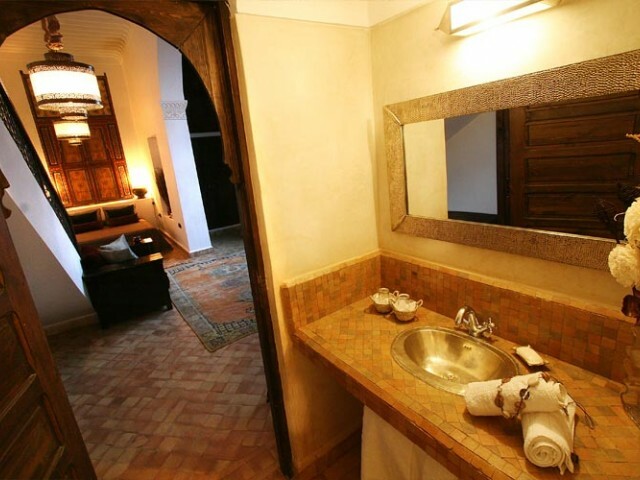 For your comfort, this suite is fitted out by a reversible air conditioning, by a safe and by a mini bar.The bathroom made of tadelakt and zellige in the same tone is decorated with a copper bowl and with a shower. 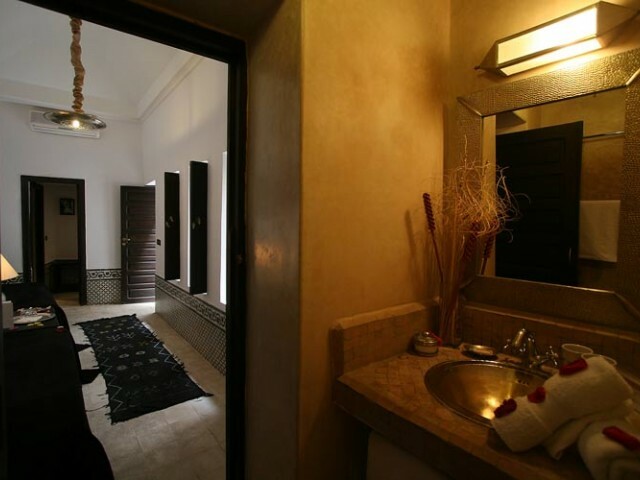 it is equipped with a hairdryer and with shower products in the scents of east. "Nous sommes partis avec nos 2 adolescents. 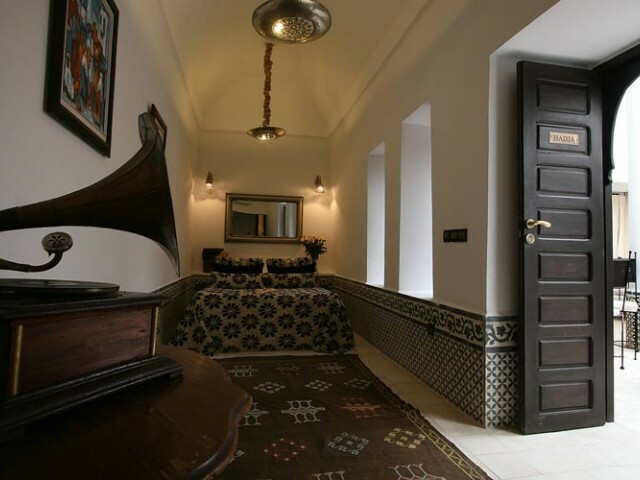 Nous avons découvert ce merveilleux riad caché dans la trés belle partie de la Médina qu'est l'ancien quartier des antiquaires.La décoration de ce riad est délicat"
- Reservation of green-fee, beginner or advanced training Course (Marrakesh, Essaouira ...). Rita, le 16 mars 2013 "Un RIAD PARADISIAQUE"
te; marocainLes chambres sont toutes différentes et superbes. Nous avions la trés jolie suite Douria. Propre et calme le riad bénéficie en plus d'un personnel discret mais attentif à notre bien-être. Sans compter la magnifique terrasse nous permettant d'en profiter à n'importe quel moment de la journée. Un véritable bonheur..."
Sourie, le 26 ao�t 2012 "havre de paix dans un décor typique et très bien situé"
de l'eau fluctuante et parfois insuffisante dans la salle de bain. Le petit bassin pour se rafraîchir avec un bon thé et des gateaux après la visite de la place animée Jama El Fna. Le ryad est situé à 5mns à pieds au milieu de ruelles d'artistes et proches des souks. A recommander." ds_59, le 11 juin 2012 "sejours genial "
euf6 jours ou nous nous sommes sentis comme a la maison mais aussi comme des princes, tjrs au petits soins et present pour nimporte quel conseilla cuisine est excellente couscous aux 7 legumes mais surtout le dessert "flan a la fleure d'oranger et aux amandes"!! delicieuxxxxavec un ABDOU méticuleux, toujours souriant! !c'est une adresse qui merite le détours nous en garderons un excellent souvenir"
nat, le 12 mai 2012 "Dépaysement total !" ouvelles aventures culinaires, humaines, culturelles?A refaire !" lol, le 19 septembre 2009 "magigue"
"j ai prit une suite la douiria pour ne pas la nomée ,elle est superbe ,le service est de c aliter ,le coin piscine est trop zen! petit massage et hammam et pour terminer petit apero pas piquer des vers sur la terrasse énorme......aller y ! a bientôt dar saad!!! talktalk, le 17 septembre 2009 "mrs"
"quality, charm and sophistication for a fantastic price . Darsaad make you feel special ! laurent, le 26 octobre 2008 "que du bonheur!!!!!!!!!"